Exciting youngster Hawker Hurricane will be set for the $2 million The Star Gold Coast Magic Millions 2YO Classic after he scored an impressive debut win in today’s $200,000 Magic Millions 2YO Clockwise Classic (1000m) at Ballarat. Winning rider Mark Zahra predicted a bright future for the son of Deep Field after he came from worse than midfield to win Victoria’s most unique race. The $150,000 purchase finished full of running late in the race to overpower the highly regarded Charvet, while stablemate and early leader Alburq was a breath back in third place. Hawker Hurricane, along with Alburq, is prepared at Flemington by Michael Moroney after being purchased on the Gold Coast from Widden Stud in January by his brother, leading bloodstock agent Paul. “He’s a very green horse and it’s lucky I drew well because I was able to save ground,” an impressed Zahra said. Moroney’s foreman Jack Turnbull said it was an exciting time for the stable to unearth their first pre-Christmas juvenile in over 10 years. “He’s trained a Blue Diamond winner in the past,” Turnbull said of Moroney who prepared True Jewels to win Victoria’s richest juvenile race, the Blue Diamond Stakes in 2001. 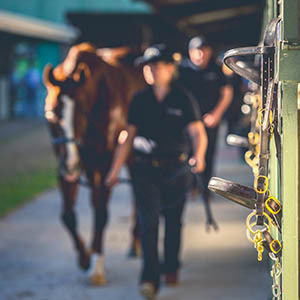 Turnbull indicated that both the winner and third placegetter would be aimed at the $2 million Classic, Queensland’s richest juvenile race in January. Both Michael Moroney trained two-year-olds carry the colours of part owner Rupert Legh who was on track to cheer home the winner and third placegetter with wife Cheryl. 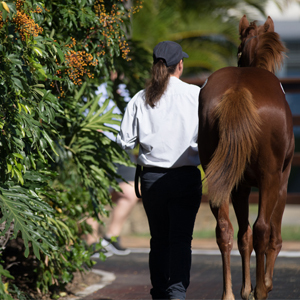 The win of Hawker Hurricane was a boost to his Super One half sister who is being prepared by Willow Park Stud for the 2019 Gold Coast Yearling Sale, where she is catalogued as Lot 916. Charvet, the most expensive runner in today’s race, impressed and looks a bright prospect for the future according to her co-trainer Natalie Young. The race was called by 16-year-old Dayne Barry, the nephew of Ballarat Cup winning trainer Darren Weir and the youngster received rave reviews from seasoned racing fans. Barry, who spent the day with Magic Millions guests and his family, said it was an incredible thrill to call such a feature race on a major day. “I was a little nervous before the race, but when the gates opened I just got down to calling – I feel pretty good now,” the likable young man added. 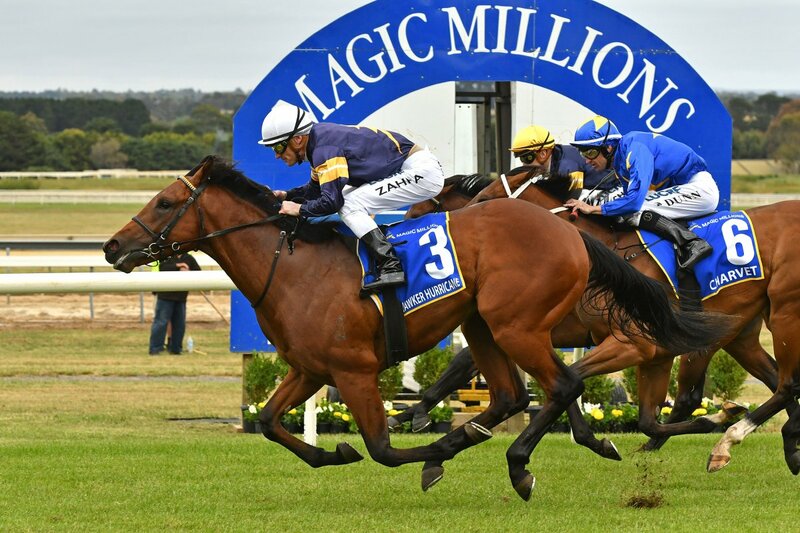 Meanwhile, Bel Sonic is also being aimed at the $10 million The Star Gold Coast Magic Millions Raceday in January after his barnstorming first up win in today’s $100,000 Magic Millions 3&4YO Classic (1100m). Trainer Jason Warren said the $80,000 Gold Coast Yearling Sale purchase would be aimed at either the Magic Millions Cup (1400m) or Magic Millions Snippets (1200m), both worth $1 million, after today’s win. 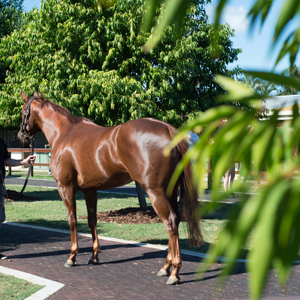 “Now he’s back in good order we’ll go up there and have another go,” Warren said of the Magic Millions Raceday in Queensland. Winning rider Regan Bayliss was delighted with the turn of foot the son of Bel Esprit showed when called up over the concluding stages. He was last for the first half of the race. The plan worked and Bayliss and Bel Sonic stormed home to beat Platinum Angel by a neck. 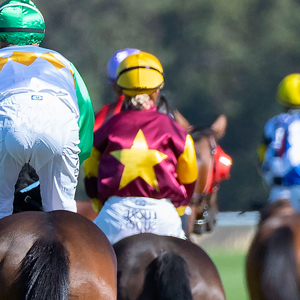 The runner-up could be aimed at the $1 million Magic Millions Fillies & Mares in January. 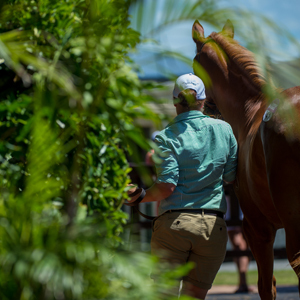 A graduate of Aquis Farm, Bel Sonic was also sold at the National Weanling Sale on the Gold Coast before returning to the same sale ring as a yearling and selling for $80,000 to Jason Warren.